Shiny [girls] backdrop. First shiny flat [girls] wall is 10 feet behind a second shiny flat [girls] wall. The sun is scarlet. Ambient light is sea blue. Sky is texture. A long flat silver wall is -2 inch beneath and behind the second wall. It is leaning back. A huge clear sphere is left of the wall. A long flat silver wall is -2 inch beneath and in front of the first wall. It is leaning forward. A huge clear sphere is left of the wall. A huge gold key is -1.2 foot above a clear water pool. It is leaning left. The pool is leaning 1 degree to the front. The ground is 40 feet wide water. A box is -1.8 foot above the pool. 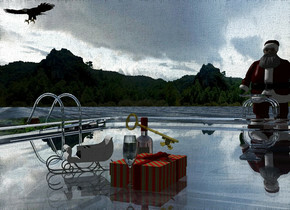 A dark man is -3 feet above and behind the pool. Camera light is black. A bottle is behind and -1 inch left of the box. A glass is in front of and -3.9 inch above the box. A very tiny sleigh is 6 inch left of and behind the glass. It is facing southwest. The background is forest. The background is short. The background is 50% dark. 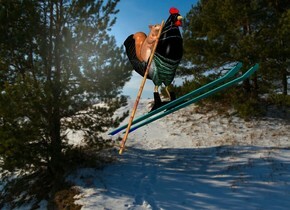 A very tiny bird is 1.4 foot above and 4 inch in front of the sleigh. 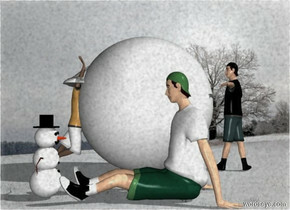 a gigantic snowball.a 1st boy is -6 inches right of the snowball.he is facing the snowball.a 2nd boy is left of the snowball.he is facing the snowball. [snow]backdrop.shadow plane.a 3rd boy is 3 inches behind the snowball.he is facing right.a small wave is -14 inches above the 1st boy.the wave is snow.the wave is -12 inches left of the 1st boy.a small snowman is right of the 3rd boy.it is facing the 3rd boy. a huge shiny [mountain] chair.a man is -35 inches left of the chair. 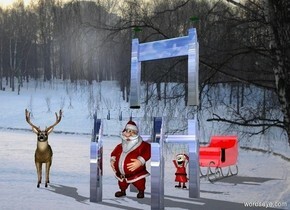 [snow] backdrop.shadow plane.a deer is 4 feet left of the man.it is facing southeast.a elf is 2 feet behind the chair.a shiny red sleigh is 6 feet behind the deer.it is 5 feet right of the deer.